The odds of stagflation eroding and gradually destroying the buying power of the average consumer in coming years is more likely than many people realize. 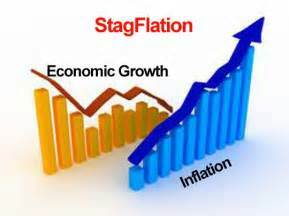 Too many people little difference exists between stagflation and inflation, however, the distinction or difference is that stagflation is often linked to times of economic slow growth. The idea that inflation cannot exist in a period of slow growth is a myth that many people believe, this may soon be proven false. A great deal of what something is worth is related to where people actually put their wealth. 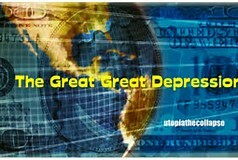 The sectors or areas of the economy that savers and investors deem safe are more important than most people realize. Price stability or even minor deflation should not be a major problem but due to the fact we seek to move upward and ever higher adds to the idea the 2% inflation target deemed as a desirable rate by most central banks is the economic sweet spot. The concept a little inflation is a good thing appears to be based on the idea it adds to the illusion of overall economic growth. This arbitrary number or target also gives central banks far more flexibility in defending a policy that results in printing fiat money (currency which derives its value from government regulation or law rather than backed by any commodity) as well as deficit government spending. For years savers have poured a great deal of their savings into paper promises such as pensions, bonds, stocks, and such. Using a slew of faulty methods to compute inflation we are constantly informed consumers are not losing a great deal of buying power, however, these methods often underweight important necessities and overweight the cost of televisions and other electronic gadgets that are falling in price. Even low-interest rates feed into this false narrative. If you want a better picture of what is actually happening focus on the replacement and repair cost that occur following a storm or other natural disaster. When it comes to economic policy it seems, sustainability is put on the back burner and the goal is just to create growth tomorrow, or in other words, full speed ahead. Our leaders find strong allies with the lobbyist who grease the wheels of commerce. A society where consumers conserve, reducing waste, and any talk of austerity usually conflicts with the goals of lobbyist hell bent on creating growth at any cost. 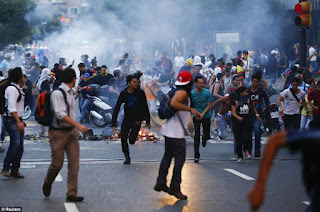 In many cases, austerity measures have been associated with public protest and claims of a significant decline in the standard of living. The argument by contemporary Keynesian economists that budget deficits are appropriate when an economy is in recession encourage governments to try to spend their way out of trouble. What we should be asking is if current policies are really creating tangible and solid growth and question if they are sustainable over time. Those touting the destructive force of deflation often use Japan as an example of what we should avoid at all cost. It could be argued that the so-called "lost decades" that Japan has experienced is the result of other factors rather than the country not adding enough stimulus. The fact is after its massive bubble burst Japan never really faced its demons and chose to keep alive zombie banks and companies coupled with increased competition from China as it began to export low price goods to America as well as dreadful demographics are all contributors to Japan's problems. We should remember that Japan's economy is driven by exports this alone makes it a far different animal than our economy. In truth Japan has not fallen off the face of the earth as its real estate and other markets fell back to reasonable levels. Until now because of their low interest rates the yen has been a favorite of those playing the carry trade game and is still seen by many as a safe haven currency. The problem they now face is at some point because of the governments unsustainable deficit the world will at some point declare the yen as worthless and the inflation they have sought for so long will wash over them taking with it much of their buying power. Footnote; The articles below link to issues related to this post. Mosul's transformation into a pile of rubble filled with the bodies of dead civilians nears completion. The destruction of Mosul continues, and as the end nears we are now seeing Mosul back in the news. Several of the news reports center around how victory is near at hand, this may be so we are prepped for the celebration and ready to give credit to those who are bringing ISIS to its knees. Over the Memorial Day Weekend on Face The Nation, Defense Secretary James Mattis made it clear, containment is not enough the goal is total annihilation and humiliation so that nothing will rise from the ashes of ISIS. Mosul and the surrounding area in northern Iraq had in the past housed about two and a half million people. Since being occupied by the Islamic State of Iraq and the Levant in June of 2014 many people have fled. Knowing that to stay was to risk your life and the lives of those with you the population today has declined to around two hundred thousand. 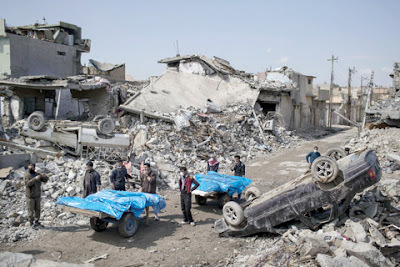 Adding to the woes of civilians that remain trapped by the fighting or afraid to flee are reports from U.S. based Human Rights Watch that Iraqi Kurdish fighters battling the Islamic State have unlawfully destroyed Arab homes in scores of towns and villages in what may amount to a war crime, in short, your potential liberators may not be your friend. The good news is that when the operation began to liberate the city of Mosul and eliminate the last bastion of ISIS in Iraq things were moving faster than many people had anticipated according to Prime Minister Haider al-Abadi. Still, problems continued to surface slowing the advance, such as a wave of car bombs sent by the Islamic State group. Iraqi special forces Maj. Gen. Sami al-Aridi said, "there are so many civilian cars and any one of them could be a bomb." As Iraqi forces try to advance further into Mosul these suicide car bombs have taken a toll. With Islamic State militants even deploying armed children in Mosul’s Old City as means to bolster the impression they are still in control it is obvious many more civilians will die before this is over. Clearly, the once great and ancient city of Mosul will be reduced to nothing more than a pile of rubble. Mosul shares this fate with many other cities in the region that have become war zones. Within the slowly shirking kill zone, it is not difficult to imagine 100,000 or more of the innocent people trapped within the city killed as troops seeking to eradicate the last of the estimated four to six thousand ISIS fighters go about their task. 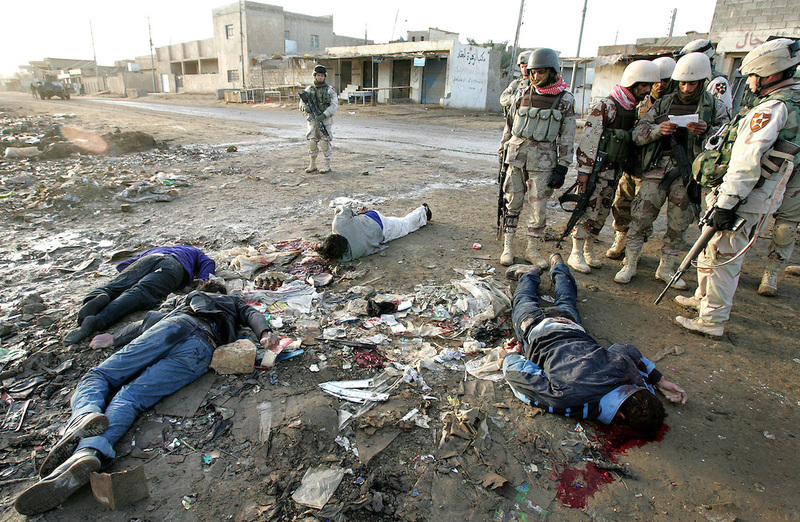 Death often occurs rather indiscriminately in such places and is dealt out to both civilians and combatants. In this case, civilians will be used as human shields increasing the toll and carnage. As for how those many tens of thousands of civilians who fled fighting near Islamic State-controlled Mosul last week many are now stranded outside the city without basic humanitarian assistance. The situation became so desperate near the end of last year it was reported that army officers began distributing rations meant for their soldiers and buying extra supplies with money out of their own pockets. We have seen this all before, when the smoke begins to clear a campaign will develop to raise massive amounts of money to rebuild and set things right but until then it is suffering and death and nothing we do will change this reality of war. An article written in the middle of November 2016 pointed out that a matter that merits our attention has become merely a footnote lost in the noise of daily news, these are the events taking place as Iraqi troops and a coalition of anti-ISIS forces try to retake Mosul. Even though they are in different countries both Mosul and Aleppo stood in the path of total destruction destined to be wrecked by the forces of war. Aleppo was of course further down this path as we have seen in the photos that have become far too common. These photos depict the total devastation and death modern warfare brings upon those caught in its way. It should be noted the Mosul offensive began in mid-October 2016, in the days leading up to the American Presidential election, at the time the offensive was expected to last weeks, if not months. The media reports were spun to let us know a forthcoming victory was in the offing, it seemed this was done to assure voters American foreign policy has not been a dismal failure. The fact is Mosul should never have never fallen. The blood and treasure wasted and spent in Iraq are in many ways a reflection and the legacy of intervening where you don't belong. When this campaign is over victory will be declared but what exactly will we be celebrating? Catalyst Yet To Be Determined! Time has a way of revealing certain realities but does so at its own choosing. It is important that we remember the power of time, it controls us rather than the other way around. During certain periods of our lives the clocks often seem to be moving at their own pace. As a child the special days like Christmas approached slower than a turtle in peanut-butter, however, vacations had a way of slipping by far too soon. The fact that events seem to advance unevenly reinforces the concept of lag time where the effect is not rapidly apparent and the idea that at times we see life passing before our eyes. Time is a powerful force and will at its leisure remind us we are not in control, all things come to an end and so will this market and the economy it has wrought. The book that I authored several years ago focused on how mankind has by way of its advancements constructed a world in which we are rapidly moving ever faster into a future that we only partially control. This brings me to the crux of this article and that is the catalyst of our economic demise remains in question. Over the years many articles have been written speculating on what will be our downfall and when we will stumble yet we have bumbled our way forward. A patch here and a patch there has allowed the flawed economic system the world has cobbled together to continue with the help of an emergency action every now and then. But has it been luck, cunning or skill that has brought us to this point? When it comes to the economy we are not talking about a well-oiled and designed machine and in the end, we may find that it is not really completely under the control of those who have been placed in the driver's seat. At any rate, many scenarios exist as to how one or more missteps may lead to the collapse of this rather fragile contraption. As for taking a hands-off approach and allowing markets to find their own way, that time is long gone and that ship has already sailed. Over the years central banks across the world have become so deeply involved in manipulating and distorting markets they are at a point where true price discovery no longer exist. On occasion, I dust off an article that I feel hit some important cords and do so now. Let the chips fall where they may is a figure of speech which means, "What happens happens" or "Let the imminent events unfold." 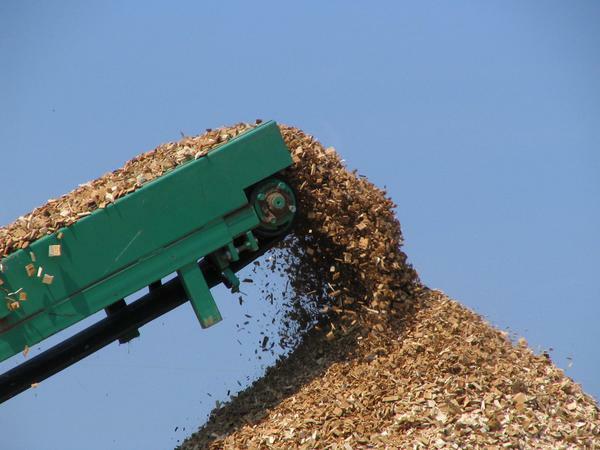 This metaphoric term dates back to the 1800s and alludes to chopping wood, "chips" refers to chips of wood. This phrase uses the image of a person chopping wood and letting the chips fly everywhere instead of trying to be neat and chop on one side so they'll fall in a pile. It implies the woodcutter should pay attention to the main task of cutting logs and not worry about small chips. It is often joined to a statement that one should do what is right, such as, "No matter what the consequences, I'm going, to tell the truth about what happened and let things and events unfold as they may. It has become abundantly clear that when it comes to the "economic chips" the powers that be have no intention of letting them fall where they may. However, several factors determine just how much influence can be applied to the how current economic policies unfold. Continuing with the metaphor of "falling chips." Things like the size of the chips, the rate or speed at which they fall, and the number of chips in the air may make them uncontrollable. My point is we could find ourselves up to our neck in chips in a blink of an eye and in the middle of an economic tsunami, all bets are off as to how successful efforts to stem a catastrophe might be. We should expect that during the final stage of a global shakedown events will be uncontrolled and become very wild. Many people have come to accept the fact the world might soon witness a major shift in the value of one investment over another as investors seek firmer ground. Derivatives, currencies, plunging stock prices, air rushing out of a bond market bubble, how debts are structured, and the timing or direction from which problems arise are all factors that must be considered. Investors are constantly reminded that investing involves risk, investing in foreign markets is subject to additional risk including currency fluctuations. This means we face the loss of principal or capital, however, year after year of climbing markets tends to make people complacent. What many people don't realize is no matter what they invest in or how safely they think they have salted away their wealth or savings risk is always lurking. The question remains how best to prepare for a economic meltdown. Values constantly change and the unfortunate situation of having your wealth in the wrong place at the wrong time can be devastating, the inability to access your funds can make the situation even more dire. It could be said that in some ways all of us are involved and playing this game whether we are aware of it or even want to be included. Another concern is the economic overlords have the power to change the rules and when this happens it generally is not to benefit you or me. During times of economic chaos, you can only hope you will not be one of those thrown under the bus. With much of the world facing down a road paved in promises that are economically unsustainable, it is likely many will be broken. Pensions and other payments granted to us in our later years are the kinds of promises that are at risk of not materializing or being cut. How Will The Dominoes Fall? Much of how things play out revolves around the issue of debt a subject of great importance to both lenders and borrowers, and again timing can mean everything when determining whether a creditor will totally default or force a lender to suffer a major write-down of their expectations. Debt is generally set to be paid over time and a balloon payment coming due at a time when money is difficult to borrow can be the kiss of doom. Inflation or deflation, as well as a big shift in interest rates, may determine the true winners or losers in this brutal game. I contend the amount of money and free currency (able to move around and be deployed) actually standing or remaining after the next major economic meltdown begins will be the determining factor of whether inflation or deflation is indeed the flavor of the day. A person may think they are wealthy or have real wealth, but will they be able to tap into it and move it about? Often "paper wealth" is merely a promise of future value. Many people would be shocked at just how little in the way of tangible assets many very wealthy people own and to find much of the wealth people own is on paper, and this is full of risk. What is often missing or overlooked is tangible fully paid for items and things that are likely to hold their value and in the direct possession of the owner. People tend to avoid tangible assets in their control because they are often inconvenient or need to be insured. Going forward we find the size of the chips, and the order in which they fall is both unpredictable and does matter in determining how an individual's wealth is affected. The story of the gold miner who labored for years then gave up and walked away set things up for the next young lad who started in to hit gold in days and strike it rich highlights that being right is not always enough, the value of tenacity should not be underestimated, and timing is crucial. A bit of luck is also helpful in a world that has become a giant casino and our economic future often a game of chance, at stake, is just how much of our wealth we as individuals can protect. 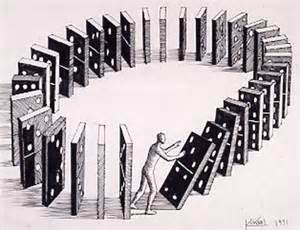 When we talk about contagion it is easy to imagine the dominoes falling, but have no doubt the direction they fall often determines which if any will remain standing. Expect both luck and caution to play a big role on our individual fortunes as we move through the financially violent period before us. Enough about Tesla being worth more than Ford and all the other automobile producers that have many times its market share. Current supporters of its value even go so far as to claim it is really a tech company masquerading as an automobile company. It should be noted that J.P. Morgan analyst Ryan Brinkman welcomes margin improvements at Tesla and the reiteration of Model 3 timing, but said execution risks remain. He rates the stock underweight with a $190 price target, up from a previous $185. I and many other market watchers see both of these numbers as far too high. 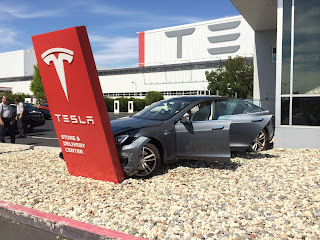 In a note Brinkman recently wrote, “We continue to be cautious relative to the potential for a slower than guided start to Model 3 assembly, and newly believe that the potential for Model 3 pre-orders cancellations may increasingly become a point of investor concern.” Nothing tarnishes a brand faster than producing a lemon or product that becomes synonymous with failure. I hate to tell Tesla lovers that owning a Tesla could rapidly become uncool if when rolled out the Model 3 fails to live up to the high expectations many of those placing orders have for the car. Tesla has repeatedly tried to lower expectations and reiterated that the model 3 is a downgrade from the model S but many of those on the waiting list may not fully comprehend exactly what this means. Do not rule out the possibility that once the aura surrounding Tesla leaves, reality may wash over those so eagerly awaiting their new toys and a main driver of sales vanish. In a world where few cars sporting the Tesla nameplate exist the car remains a novelty that garners the owner a bit of notoriety. So far the attention gained has been positive, however, if it were suddenly to turn negative not only would many owners lose a bit of bounce in their step but the value of their cars could drop like a stone. As this is written we are forced to wonder just how much of a downgrade the model 3 will be and how it will be received. Many questions still exist as to whether its roll-out will be on time or delayed by a series of glitches and problems that often plague new models. If the actual car fails to tantalize buyers or leaves them underwhelmed it could be all over. One is born every minute refers to a fool or sucker. There's a sucker born every minute" is a phrase closely associated with P. T. Barnum, Buying stock in Tesla is the same as going to a casino, it will end with you being most likely a goat rather than a hero. Remember the companies Musk is involved with have been on the government dole. Like many high-flyers before him, Elon Musk has a history of promising more than he can deliver which investors and the market has chosen to ignore. I have written several articles about Musk and Tesla not because I'm wowed by either but because they are both poster children of a market which I feel has discoupled from reality. Do not be surprised if looking back someday in the future we view Tesla's stock which continues trading at incredibly high multiples as a reflection of our historically low-interest rates and the luck of being in the "QE moment" rather than the company's financial success. Bears and those that doubted if the company could hold together ironically have pushed up the stock adding to the image that Musk lives a charmed life. In the past, I and many others have pointed out the uphill battle Tesla is fighting and the many obstacles that could derail its success. 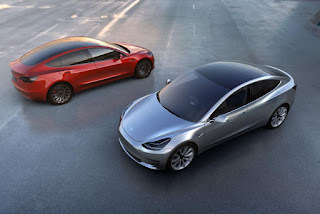 In May of 2015 David Stockman wrote; In a world saturated with excess automotive capacity and dominated by some of the most formidable engineering, manufacturing and marketing organizations on the planet—Toyota, BMW and Ford, to name just three–There is no way that an amateurish circus barker like Elon Musk will ever make a profit selling electric vanity cars to the 1%. Stockman went on to state, You might describe Tesla as $30 billion of capitalized hopium, but that would be too generous. In an honest free market, Tesla would have long ago been carted off to the chapter 11 junk shredder. Oh, how sweet and challenging the auto industry is, like a fickle mistress it has those in its grasp always on their toes or they will suddenly find themselves crushed by their overconfidence. A marvelous example is how Ford in the 1950s ambitiously rolled out the car everyone was waiting for. Unfortunately, their ambition gave birth to the Edsel, whose name became synonymous with abject corporate failure and while the nascent brand was killed in 1959, its legacy lives on. The Edsel's short history makes a fascinating cautionary tale for anyone in business–not just the car industry. In the end, the name of Elon Musk may be added to a long list of bold men herald and declared to be "gods gift to business," only to find they flew too close to the sun only to crash and burn. Footnote; The link below is a recently updated article written since Musk started talking about taking Tesla private and an overview of Elon Musk and Tesla Motors. It gives some of the background story behind their rise to prominence. Footote #2; Below is an article highlighting how Tesla's competitors have not been sitting on their hands or surrendered the electric car market to the upstart. 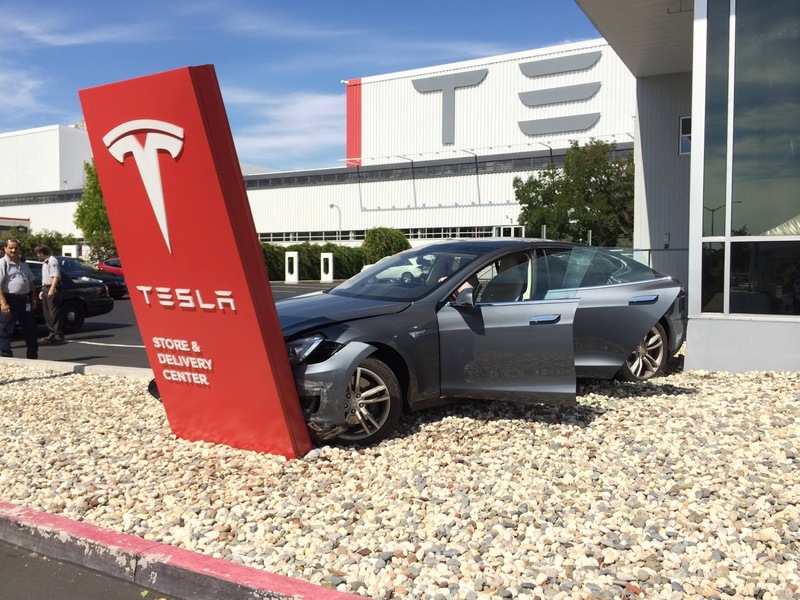 A gruesome Tesla crash in Calafornia, production problems, growing debt, and the fact Tesla is burning through cash is causing investors to question Tesla's high stock valuation. The article below delves into these issues. During April of 2016, I wrote; We should not wait until someone is gone to salute them in tribute. Life is finite and at some point, we should acknowledge we are nearing the end. Allan H. Meltzer, a distinguished monetary economist and historian and a longtime professor of economics at Carnegie-Mellon Institute, died last week at the age of 89. While he had a long and productive life I only wish Allen had lived long enough to have seen he was right on what has been happening since 2008. An older lady often told me "she no longer bought green bananas" as a way of saying she recognized this truth. In that spirit, I'm writing about a person born in 1928 that while viewed by many economists as America’s foremost expert in monetary policy is little known by the masses. This post is not only in tribute to Allen Meltzer but to make clear that just because we have muddled along putting band-aids on our economy does not mean that we have done anything but postpone the day of reckoning, and in many ways, we may have made it far worse. The time the Federal Reserve has bought for the country to come to terms with its many problems has been squandered at a great cost. While many people say the economy is getting better others like me who are involved in business on Main Street all across America say this is not true and that an ugly reality is only being masked by the easy money and deficit spending policies we have today. While it is difficult to time when certain events will unfold it is clear the direction we are moving in. While the doors are open it seems Washington remains "closed for business" and nobody has seemed to notice or care. This could be one of the reasons the stock market has continually made new highs as the economy struggles with multiple issues and faces an uncertain future. Seriously, even this could not explain wall streets disconnect economic reality, however, it is difficult to argue with the fact America's capital is locked in a dysfunctional mindset. Anyone who thinks Obamacare is well on its way to being repealed or replaced by a "better plan" is delusional. 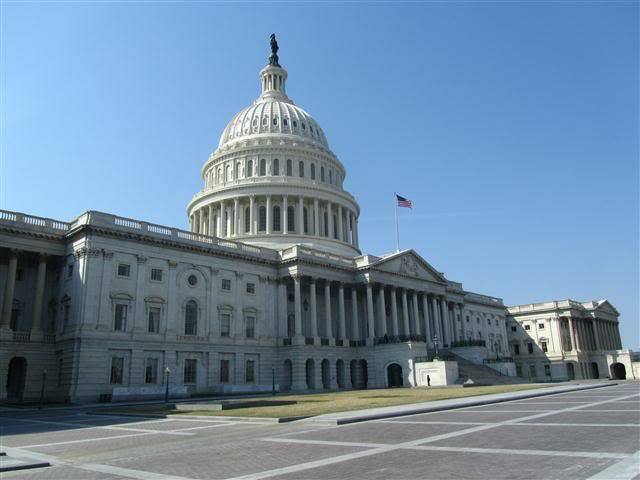 Other than a celebration when legislation claiming such a feat passed the House little of substance is in the works. Just as remote as a "fix all for healthcare" is the likelihood of a tax plan being signed into law anytime soon that will simplify or solve are budget woes. This has done little to slow the advances of stocks on wall Street because in the eyes of those buying stocks such a deal is in the bag. They are oblivious to the reality no intelligent plan has been written or is moving through the halls of congress. The fact is we cannot cut taxes while increasing spending at the same time and not explode an already massive national deficit. The odds of getting a complicated tax reform bill through a polarized and divided congress are nil. In fact, most of the developed countries across the world are in exactly the same boat and upcoming elections hold little promise that things will be sorted out soon. Thank goodness for the distractions that allow us to take our eyes and minds off the business of making the necessary structural reforms to move forward. The recent firing of FBI Director James Comey by President Trump can be considered one of those distractions. While few Americans were love struck over Comey this has stirred up a hornet's nest and energized Trump's critics. 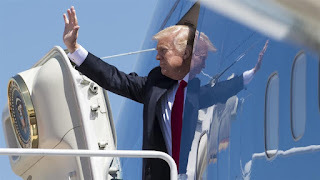 Only so many hours exist in a day and when they are spent or wasted in speculation the bottom-line is if nothing is getting done, Washington might just as well be closed for business. It is difficult to believe the productivity of Washington could drop any lower, and while our elected officials busy themselves with calling for further investigations and making promises of getting to the bottom of this America putters along on autopilot. The flavor of the day is same as it was yesterday and the year before, nothing has changed. The politicians and Washington elite continue dithering away their time as well as the money of the American taxpayer and even that of future generations. With matters under control and having completed his strenuous first 100 days in office President Trump is about to head off on a global fly about to meet with various world leaders which should result in more of the same. The days of "Hope and Change" are behind us and we are firmly on the path towards making America great again, unfortunately, the message has fallen on deaf ears when it comes to our elected officials in Washington. Tonight I will raise my glass and toast the cynical and skeptical Americans scattered across this great land for again they are well on their way to being right about how nothing really gets done until the last minute and even then if delay is an option it will be exercised. To top things off tonight as I get ready to post this article the White House has gone into damage-control mode after a report that Trump revealed classified information in a meeting with Russian officials last week. Ironically this may be as good as it gets.